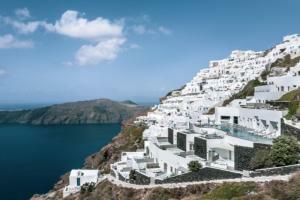 Perched above the world-famous Caldera, this beautiful boutique hotel offers an idyllic escape. Rooms and suites that showcase a contemporary style, combining cutting edge, innovative design and traditional accents. The exquisite infinity pool offers stunning, uninterrupted views of the sparkling Aegean Sea, while the gym, yoga and Pilates studio provide an enriching wellness experience. Enjoy delectable Greek cuisine at the awarded Santoro Restaurant, with unparalleled views of Santorini's dazzling sunsets. The perfect choice for a romantic getaway or honeymoon. Secluded, yet just 2 km from the capital Fira, Grace Santorini is 8km from Monolithos Airport and 10km from Athinios Central Port.